Now that my home's internet speed is upgraded, I can make more videos! Lydia loved this, she said it taste like milk cookies. LOL. Tebaloi is a traditional snack of the Melanau tribe of Sarawak. I first had a taste of this back in 2001 when I went to Sarawak for 11 day, on a fun trip with my uni mates. I fell in love with it at first bite. It was absolutely delicious and addictive. We bought these mostly at souvenir shops and they don’t come cheap for that few pieces of cookie. Now it’s even more expensive, 50% more of what I used to pay, if I didn’t remember wrongly. It used to be RM2 per box, but now it’s RM10 for 3. After making this myself, I came to realize… how much the middle man made of out of this. The high price of each box mostly goes to the cost of the printed box and the souvenir shop owner and the middleman, of course. Furthermore, coconut may not cost as much if they were to source it nearby in their village. It tasted different from what I use to have, less coconutty, therefore, less fragrant. I shared 1 pack with fellow bloggers and they weren’t very impressed with it, like I said, this box of tebaloi wasn’t as good. Different brands, different quality. You won’t know not until you buy and open the pack. 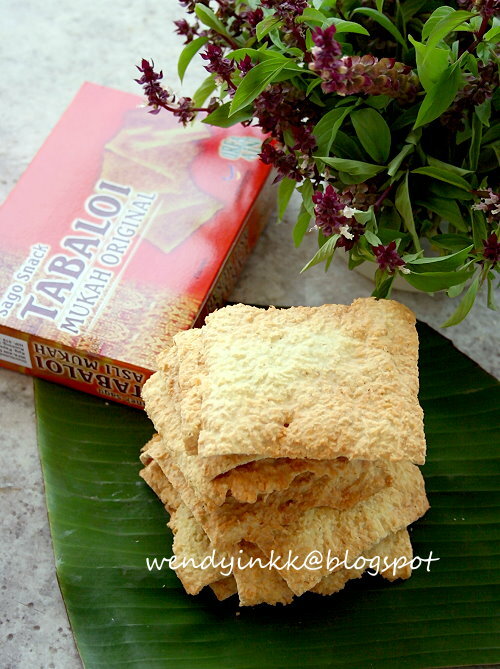 But my dear blogging friends, do not let that one box of tebaloi stop you from trying more. The real thing is actually much better. When it was fresh out from the oven, I chomped on one right after it cooled and crisped up. 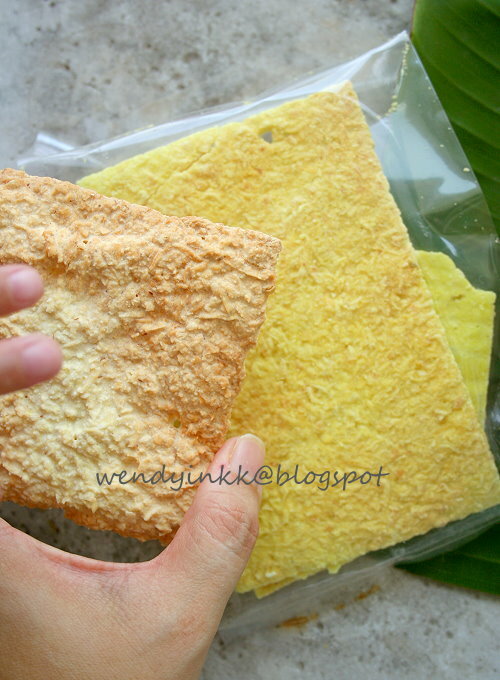 It was absolutely delicious and fragrant, like a thick Kuih Kapit with more texture to chew. 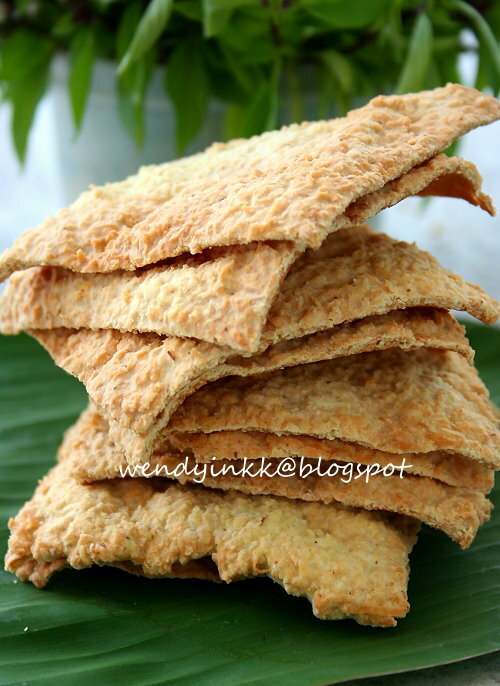 If you like Kuih Kapit, egg rolls or love letters, which ever you may call it, give this Sarawakian snack a try, you might fall in love with it as much as I do. 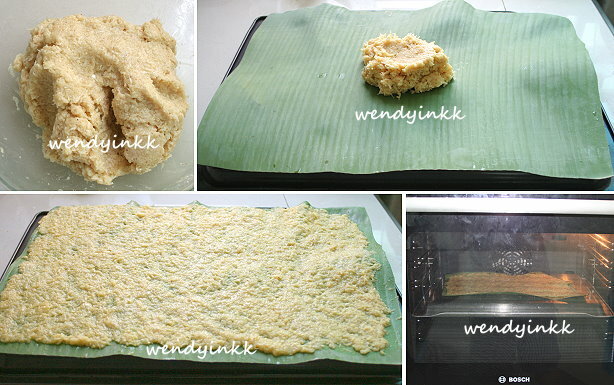 If you can’t find banana leaves, you can use non stick baking paper. 1. Mix sugar with egg and lightly whisk. 2. Combine the coconut, sago flour and turmeric powder and mix evenly. 3. Pour the egg mixture into the dry ingredients and mix until a dough forms. If it feels too dry, use your hands and squeeze the dough, it will turn moist. 4. Preheat oven to 180C (no fan) and then lay a piece of banana leaf on an overturned baking tray. Matte side of the leaf facing up. 6. Bake for 10 minutes. 7. Remove from oven and transfer to a cooling rack. Let it cool for 2-3 minutes. It will still be warm. 8. 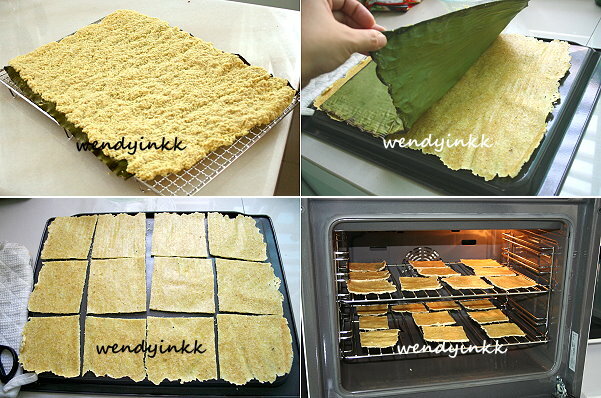 Then flip the tebaloi sheet, and peel the banana leaf off. Snip the tebaloi sheet into smaller squares. 9. Place the squares onto a baking grid and bake for 160C(fan) for 20-30 minutes or until lightly golden. 10. Place them onto the rack to cool off and it will crisp up. 11. Keep in air tight jars. Ooh...Wendy, this looks so good. I missed tebaloi. DH & I loved it also when we had it in Kuching 2 years back. Now, I can make some. Very information. I tried it once too when I was holidaying there and it tasted horrible. Bought mine from those souvenir shop. The tebloi we buy from shops unfortunately has really depreciate in terms of taste. I don't know, maybe you just can't really mass produce these things so much, the small home business ones still taste quite good. oh this sounds really delicious. I've never had it before, but it sounds quite simple to make so maybe I will try one day. Thanks for sharing, Wendy! Oh no don't KIV, make ASAP, hahaha. Some brands are fine, but not this one that I got. I bought a few brands last time, and indeed, some are nicer than the others. I suspect the mass productions ones are using dessicated coconut so that the cost can be reduced and longer shelf life. If not, how come the smell is missing? Oh yes, very easy to make. Try it ASAP and join our event! Wendyyyyyyyy!!!!! I think i will love this!!! Ok! I'm gonna give this a try! Hehehe... stay tuned! By the look at it, it must be crunchy. Something new to me. Seriously, I have no idea much of the Sarawak delicacy other than the kek lapis. It looks very crispy and appears to be easy to make. Thanks for the step by step photos. I have never baked a cookie or biscuit before and perhaps I should start with this! You really hard working posting so many dishes so frequently I have a hard time catching up lol! this is another delicious recipe that I would love to try...your coconut is sooooo white! Definitely can't get it like that here! Hi Wendy, I went to Sarawak for a holiday 2 years back but completely have no recollection of this at all. I imagine the frgrant coconut infused with the fragrance from the banana leaf would be very lovely. 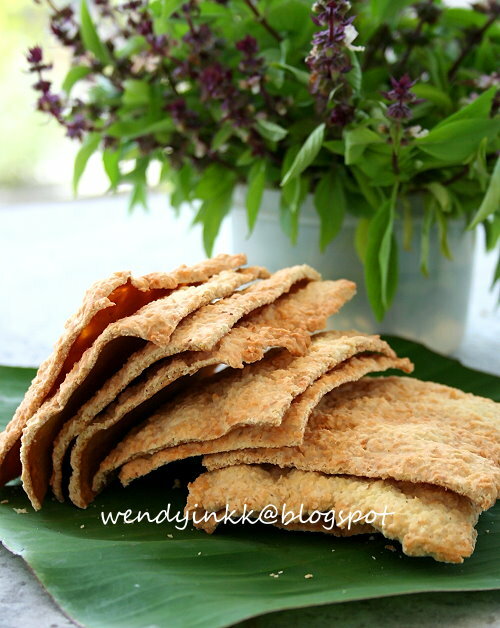 These cookies look so crunchy, and reminds me of keropok. Oh Wendy, now you make me really miss home! I want these biscuits now. They are one of my top favourites. 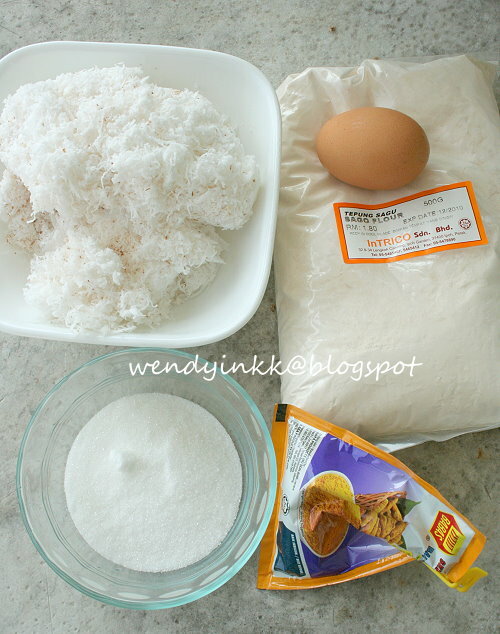 Looking at your recipe, I think I can't make it here cos I can't find sago flour here....hmmm. Just wonder whether I can substitute with tapioca flour. Thanks very much for sharing. I am intrigued...have not had this before. the taste of the ones that you shared with us recently still lingers in my mouth! haha! me kwa cheong or not? yes, very nice! i think my mum will like these. wait lah, after some of the events over will try to make some! It's not nice to call you ANONYMOUS, so please leave a name. From 15/11/13 onwards, I will NOT reply comments with no name. You won't see them appearing immediately if it's not a fresh post. This work is licensed under a Creative Commons Attribution-Noncommercial-Share Alike 3.0 Malaysia License. I understand that sometimes recipes are adapted and altered according to individual needs. Please credit if my recipes are used, especially my "Personal Creations".